Bam Bam – Lebanon Daily News Pet of the Week! Bam Bam is the Lebanon Daily News Pet of the Week! click here to watch Bam Bam in action! Bam Bam is a one year old neutered male American Pit Bull Terrier / Boxer mix. Bam Bam came to our shelter as a stray in September. Bam Bam would do best in a home with children age 12 and older. Our volunteers tell us Bam Bam is a real sweetheart once he is outside of the kennel in the yard. Bam Bam absolutely loves to play ball! Bam Bam would do well with some basic obedience classes to fine tune his manners. Another little secret about our BAM BAM is he may possibly like cats! Imagine that! Stop in our shelter today to meet our handsome BAM BAM! Brandon – Lebanon Daily News Pet of the Week! Brandon is a male white and buff domestic medium hair kitten. Brandon has big feet and we predict he will be a big boy! Stop in today to meet our affectionate boy Brandon! 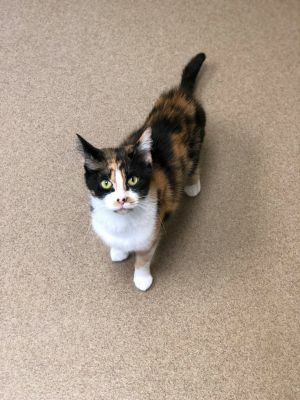 Hannah – Lebanon Daily News Pet of the Week! Have you heard? Our Hannah is famous! HANNAH is a five year old spayed female American Staffordshire Terrier. When she arrived at the shelter as a stray she had a bit of a skin condition. The friendly folks at the Humane Society of Lebanon County have given her great care and her coat is looking much better! She loves to be active and run and play! After she gets all her energy out she is an honest to goodness cuddle bug. Want to know a secret? Our volunteer dog walkers give the best belly rubs, which is great, because Hannah love belly rubs! Hannah would prefer to be your one and only pet in your family. No furry siblings for Hannah please! Tristan is Pet of the Month! Sophisticated, calm and tidy with his litter box best describes Tristan. Tristan is a seven year old neutered male Domestic Short Hair who needs a forever home! Tristan came to us as a very scared and very injured kitty. He was not well taken care of and had several fractures when he arrived. Due to his fractures, Tristan has an early onset of Arthritis. Fortunately, this does not affect his mobility. Tristan is a sweet and laid back guy who constantly purrs. We are looking for someone out there who can adopt Tristan and spoil him!! He deserves it!!! If you have any specific questions about Tristan give us a call at 717-628-1369 or email us at khess@lebanonhumane.org. We are so very proud of our team member Sam Heiser! We are so grateful to have her and she truly is the “Dog Whisperer.” Read about the story HERE.